It isn’t news to you guys, but we’ve been incredibly excited about the upcoming Disney movie Moana! With beautiful art and animation, a “rock” solid cast, and Lin Manuel Miranda writing the score, all evidence points to this being an incredible movie. Well good news! We just got a sneak peak of some behind the scenes footage, and it’s totally adorable! This 13 minute clip is filled with some amazing little moments. Lead actress Auli’i Cravalho of course crushes it as the adorable, Moana. It also helps that for a good part of her footage she’s rocking a flower in her hair that we could totally see Moana wearing in the film. On top of all that, she has an incredible singing voice that we get to hear in action! 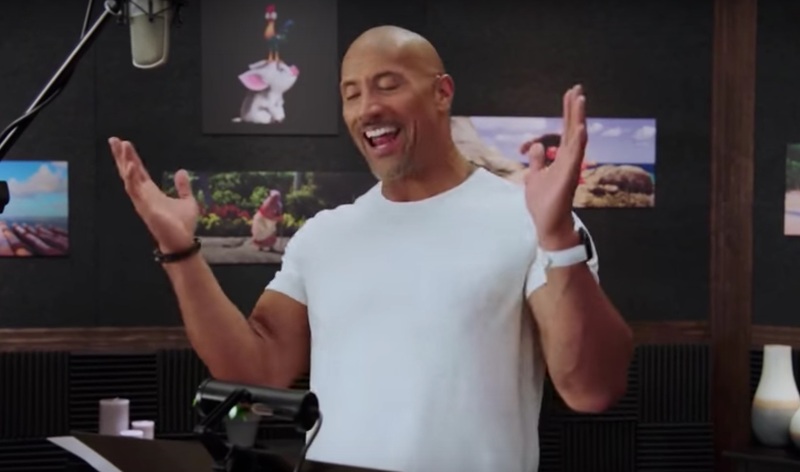 Dwayne Johnson as the god Maui is one of the best things we’ve seen in a while. He totally nails the tough-yet-cuddly action hero that we love so much in Disney movies. We also get to hear some of his songs, and he knocks it out of the park. And comedian Jemaine Clement as Tamatoa, the magical treasure obsessed hermit crab, is totally hilarious! He completely gets into character and it’s easy to see how funny he’s going to be in the movie. It’s so awesome to see how this adorable and talented cast works behind the scenes. We seriously can’t wait for this movie! Lucky for us, it’s coming out on November 23rd, so we don’t have to wait much longer.